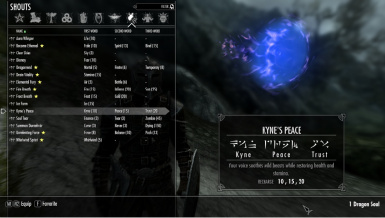 This mod changes only the Kynes Peace shout. It adds a health/stamina restore effect to the shout and adjusts the shout timer for balance purposes. This is a very basic mod that turns Kynes Peace (a shout I never used more than a couple times in my over 400 hours of playing) into a restoration shout. I decided to make this mod because I am playing a character that I would prefer to not use potions or magic for my healing purposes. I also chose to modify Kyne's peace because I think it balances my game to require spending the dragon souls to acquire a healing shout, and also gives more use to the shout itself. The shout description was modified to: "Your voice soothes wild beasts while restoring health and stamina." No scripts are added to the game, no items or characters are added to the game. This shout modifier should be compatible with other shout mods, just make sure it is loaded after your other shout mods.